Luke Berry scored both goals as Conference leaders Cambridge booked a place in the second round of the FA Cup with victory over League Two Bury. The non-leaguers broke the deadlock after Berry swapped passes with Harrison Dunk before keeping his composure to finish past Brian Jensen. Bury's Shaun Harrad thumped Andy Procter's cross into the top corner with a fine header just a minute later. But Berry nodded in the winner to set up a home tie against Sheffield United. The initial tie was postponed because of a waterlogged pitch, with the rearranged meeting ending in a goalless draw. The win secures a meeting with Nigel Clough's Blades on Sunday, 8 December. "I said after the first tie that I couldn't prouder of them, but I'm probably even more proud tonight. "For a game and an hour, we were absolutely terrific with the ball, and the last 30 minutes was about blood and guts and real desire to make sure we won the game. "We stopped making the small gains you need to make against a team like that, they scored a goal which rocked us back a little bit. "I think the best team has gone through. To dominate a team from a league above us for as long as we have done is full credit to the players." "I'm frustrated. I thought we were going to go 2-1 up on a couple of occasions. "We hit the post with a header, Craig Jones has had a great chance, and then they go and score from a set-piece at the other end. "They're decent chances, and then to go and concede one from a set-piece is not very nice. "If you look at the Football League Show, you'll see how many goals are conceded from set-pieces. We tell the boys how important it is. Sometimes people switch off, and you can't afford that because, like you've seen, you get punished." Match ends, Cambridge United 2, Bury 1. Second Half ends, Cambridge United 2, Bury 1. Kwesi Appiah (Cambridge United) wins a free kick in the defensive half. Foul by Euan Holden (Bury). Attempt saved. Euan Holden (Bury) left footed shot from outside the box is saved in the centre of the goal. Substitution, Bury. Euan Holden replaces Tom Soares. Substitution, Bury. Danny Mayor replaces Richard Hinds. Goal! Cambridge United 2, Bury 1. Luke Berry (Cambridge United) header from the centre of the box to the centre of the goal. Assisted by Richard Tait with a cross following a corner. Corner, Cambridge United. Conceded by Brian Jensen. Attempt saved. Ian Miller (Cambridge United) right footed shot from the centre of the box is saved in the top right corner. Corner, Cambridge United. Conceded by William Edjenguele. Greg Taylor (Cambridge United) wins a free kick in the attacking half. Foul by Shaun Harrad (Bury). Andrew Proctor (Bury) is shown the yellow card. Adam Cunnington (Cambridge United) wins a free kick in the defensive half. Foul by Andrew Proctor (Bury). Attempt missed. Tom Champion (Cambridge United) right footed shot from outside the box is too high. Josh Coulson (Cambridge United) wins a free kick in the attacking half. Foul by Danny Hylton (Bury). Luke Berry (Cambridge United) wins a free kick in the defensive half. Danny Hylton (Bury) hits the left post with a header from the centre of the box. Ian Miller (Cambridge United) wins a free kick in the attacking half. Attempt missed. Craig Jones (Bury) header from the left side of the six yard box is close, but misses to the left. Foul by Tom Champion (Cambridge United). Andrew Proctor (Bury) wins a free kick in the attacking half. Attempt saved. Adam Cunnington (Cambridge United) header from the centre of the box is saved in the centre of the goal. Corner, Cambridge United. Conceded by Tom Soares. Corner, Cambridge United. Conceded by Dean Howell. Goal! Cambridge United 1, Bury 1. Shaun Harrad (Bury) header from very close range to the bottom right corner. Assisted by Andrew Proctor with a cross. Goal! Cambridge United 1, Bury 0. Luke Berry (Cambridge United) right footed shot from the centre of the box to the centre of the goal. Assisted by Harrison Dunk. Craig Jones (Bury) wins a free kick in the defensive half. 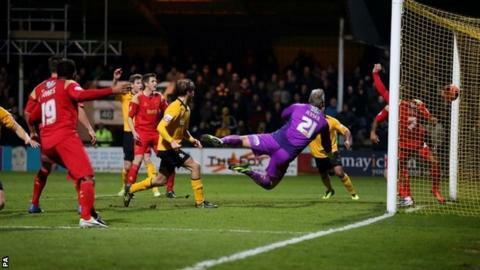 Foul by Harrison Dunk (Cambridge United).